In March of this year, PeaceGeeks was one of the winners of the Google Impact Challenge. They took home $750,000 to bring their “Services Advisor” mobile app/system to Canada (previously used in Jordan with UNHCR) focused on connecting newcomers to Canada with services, including service tracking, etc. PeaceGeeks is a global non-profit, volunteer organization that uses technology to build the technological, communications and management capacities of grassroots organizations who work to promote peace, accountability and human rights. You can find out more about PeaceGeeks and the Google Impact Challenge, and their winning proposal. Their media kit is worth a view, to see how they positioned the project. 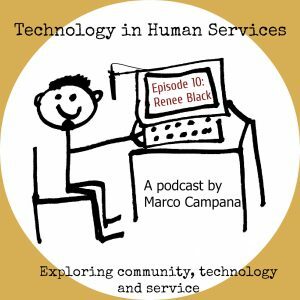 In this episode, I spoke with Renee Black, Executive Director of PeaceGeeks to find out more about Services Advisor Pathways and where it’s going. For human service workers looking to innovate with technology, the advent of the “civic tech” volunteer has had a deep impact. I delved into that a bit when I interviewed Joséphine Goube of Techfugees in episode 8. Renee and I spend some more time talking about that, including how community service providers could better harness the expertise and energy of civic technologists like PeaceGeeks. PeaceGeeks’ Services Advisor Pathways was highly endorsed by the immigrant-serving agency community in Vancouver. Part of that, I think, comes from their November 2016 #peacehack, where PeaceGeeks brought technologists and the settlement sector together (http://peacegeeks.org/news/peacehack-hacking-improve-immigrant-and-refugee-settlement) and identified some challenges as well as opportunities for solutions. I asked Renee about their Design Thinking methodology and how the community service sector could benefit from learning more it. There may be a lot we do implicitly in human service work around design that would be worth making more transparent and collaborative. I think we can learn a lot from our civic tech supporters when it comes to Design Thinking. The Services Advisor Pathways is simple in many ways. But it also has the potential to scale across the country (and beyond) into other communities, with other community partners. When we spoke, I think PeaceGeeks was reeling a bit from the sudden cash infusion. But what I heard from Renee was a promising continuation of a collaborative approach. Since we spoke earlier this year, Renee tells me that their Turkey and Jordan versions of Services Advisor are now live. PeaceGeeks expects to have their first prototype of the new Pathways app ready for demo in Spring 2018. It will be interesting to see how the project rolls out. This entry was posted in Online Service, Technology in Human Services Podcast and tagged civic tech. Bookmark the permalink.